Yea, though I walk through the valley of the shadow of death, I will fear no evil (Psalm 23:4, NKJV). Valleys are a certainty of life. Your job is eliminated. Your husband is having an affair, or your teenage daughter is pregnant. Financial pressure suffocates dreams, or the betrayal of a trusted friend inflicts a wound so deep and painful that you long for that valley of death. Each day is thick with fear, and your heart is filled with disbelief. The valley may suddenly be before you in a time of loneliness or in the shock of a dire medical diagnosis. How do we deal with those valleys? “Whatever You want me to do, Lord, I will do. Whatever You want me to say, Lord, I will say. Whatever You want me to think, Lord, I will think. We can rejoice when we run into problems and trials, for we know that they are good for us—they help us learn to endure. And endurance develops strength of character in us, and character strengthens our confident expectation of salvation. And this expectation will not disappoint us. For we know how dearly God loves us because he has given us the Holy Spirit to fill our hearts with his love (Romans 5:3-5 NLT). Join Mary and women across the world each Wednesday beginning September 5 for a free Facebook Live Bible Study, Sandpaper People. 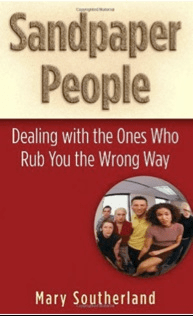 Learn how to deal with the difficult people in your life. Perfect for personal or small group study.